It is no denying the fact that electric knife sharpeners are most popular and widely used because of their convenience and ease of use. But it doesn’t mean you can completely ignore manual sharpeners and their benefits. If you don’t have power supply all the time at home, you can easily go with manual knife sharpeners. Though it may seem doubtful why we are forcing you a lot to manual sharpeners over electric models, it is true that they provide total control on the process of sharpening. Nothing can go wrong when you focus more on what would you want to do. Quality also plays a vital role in choosing knife sharpening system. What is Manual Knife Sharpener? Manual or Pull-through knife sharpeners come in different styles and shapes and all of them work the same way. Simply speaking, pull-through knife sharpener is the machine on which blade is pulled through it and you can get more natural and sharper blade. You can buy these types of knife sharpeners for different tasks and they are used widely for kitchen knives. 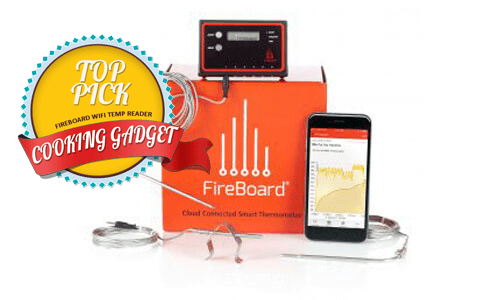 Ease of Use – Irrespective of common belief, it is true that these devices are very simple to use. Consider the overall design of the sharpener and get hold of it so you can run blade though it smoothly. Sharpening Options – Consider choosing the manual knife sharpeners which provide various sharpening options. Fine and coarse are also the common choice and some provide options to sharpen serrated knives. Easy to Replace Parts – When you decide to buy manual sharpeners, we recommend you to choose whose parts are easily available so you can use them for years to come. Since abrasive parts are prone to wear out after constant use, be sure they are easy to replace. These sharpeners can save you from replacing your existing knives. You can sharpen them and keep them in excellent condition. Angle adjuster – If you want to achieve the sharpest edge that you want, be sure to choose manual knife sharpener that can sharpen the blades in varied angles. It will usually work as a knob and you can adjust its angle. It is wise to choose sharpeners with angle adjuster. Just because electric knife sharpeners do all the work automatically, it doesn’t mean manual knife sharpeners are hard to use. These types of knife sharpeners are just as easy as electric ones. Though it needs the use of both hands, the process is simple enough. Grab the handle of sharpener and hold tight. Grab the knife’s handle and pull the blade though the sharpener. Repeat this process until the edge meets your needs. The process is basically simple and you can get it done within seconds. Don’t go with its small size. This pint size cutie is a complete workhorse for your cutlery. You can sharpen your dull and damaged blade quickly with its KitchenIQ Edge Grip. It can sharpen your blades with just a couple of pulls in coarse slot which has carbide blades at pre-defined angles to restore your dull knife. Fine slot finishes and polishes the edge of knife with few pulls. The small size of Edge Grip is easy to store in you drawer. The Fine Slot will never let your knives go dull. 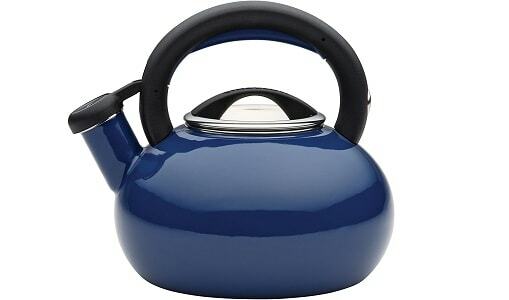 Its gentle ceramics maintain its lifespan. It polishes the edge of knife and keeps it sharp. So, run the blade through it every time when using it. Sharp knife also boosts prepping in your kitchen. 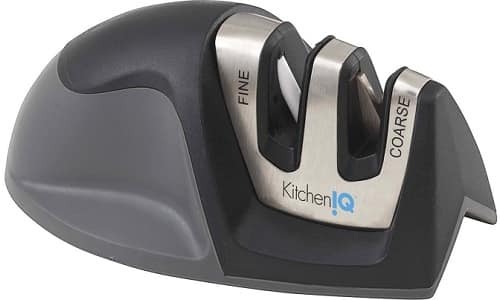 PriorityChef Diamond Knife Sharpener is the whole-new and best tool to retain the top shape of your kitchen, pocket, utility, and hunting knives. It has two wheels out of which one is diamond coated for sharpening coarse blades. It shapes your knife with double-edge finish which lasts longer. This wheel is tilted slightly so the edges shape each side of knife when you pull the knife. The wheel is very vital to work with the sharpener. Another wheel is best-quality ceramic wheel to hone your knife and repairs any small imperfections or nicks from edge. This section can also sharpen all serrated knives. All you need to pull your knife through it until you get that sharpness you need. You can easily hone your knifes through this section. Chef’s Choice 4643 ProntoPro Angle Select Diamond Hone knife sharpener is the best choice for American or European style knives and want to get the shaving-sharp, superior edge. These knives are edged well and sleek. It is the fastest sharpener or 15-deg edges to sharpen your Asian style knives as well as 20-deg edges for American/European style knives. The manual sharpener has 100% diamond abrasive wheels, precise angle guides, and CrissCross sharpening for durable, razor-sharp, arch-shaped edge. These blades give burr-free edge to cut seamlessly. It also polishes edge with honing stage. It can sharpen all your knives, such as kitchen and household straight edge knives, sports, Santoku, pocket, and serrated knives. 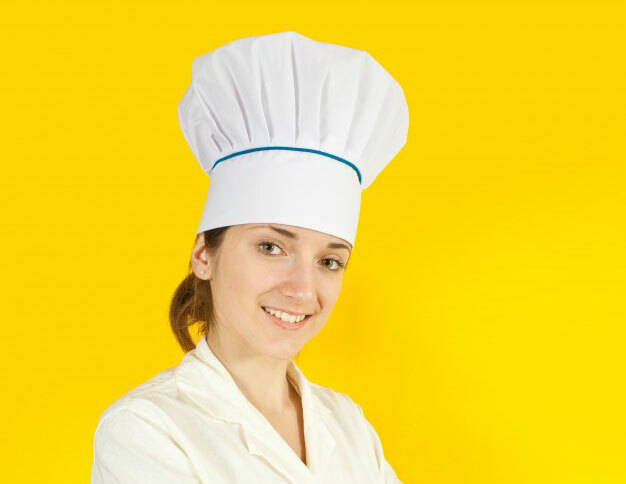 Nobody likes blunt knife in their kitchen as it is not only useless, but also dangerous. 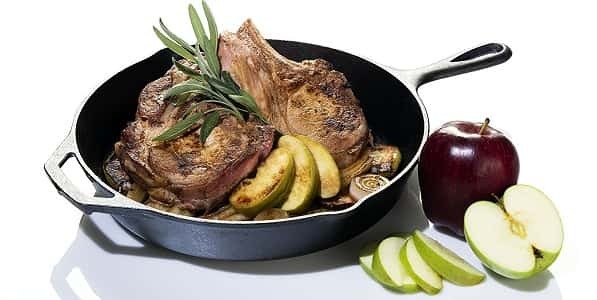 Dull blade is not that sharp to cut food. On the other side, it can easily slip off and nick your fingers or hands. 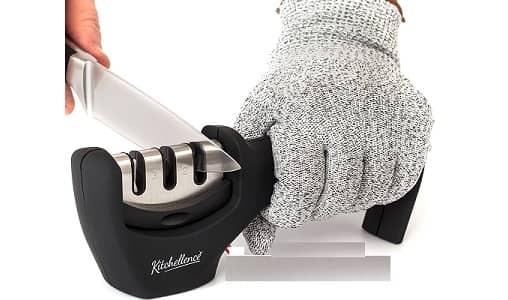 Kitchellance Knife Sharpener is designed to keep cooking safe, fun and healthy with 3-step system. It repairs and improves damaged blades. It can even work on ceramic knives. It recovers blade to V-shape and tungsten steel sharpens your coarse blades. 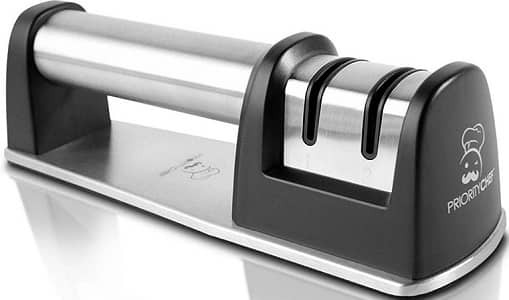 Whether you are a pro chef or a beginner, this knife sharpener is both simple to use and fast. Run it through each slot for razor-sharp edge. It has got ergonomic handle and non-slip base to control your tool with ease. It made of robust ABS plastic and it is best for both right and left-handed users. Blunt knife is seriously a major turn-off to cut the food and it hardly makes cooking easier. So, you need to polish and re-sharpen your knife to improve the convenience in cooking. This ceramic knife sharpener is the best choice for your kitchen due to several reasons. Easy grip handle is the first reason to choose this product. It is very quick and easy to use and sharpen your knives. It has got very user-friendly, compact, and attractive design. You can easily sharpen your straight knives with 3-stage wheel system that has diamond coating. It can easily and safely sharpen your dull knives. 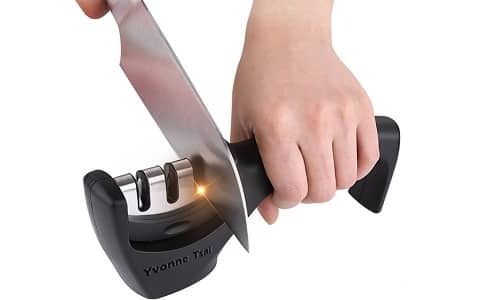 With this knife sharpener, it can keep your straight-edge knife very sharp. You can hold it securely with its non-skid pads and soft touch handles. It creates sharp edge without even removing any metal. You can get it with just few strokes. 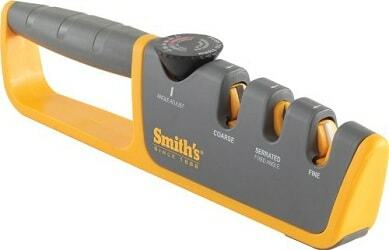 Designed for sports lovers who are looking for the best quality abrasives and sharpening tools, Smith’s manual knife sharpener is designed to provide innovative features that you cannot find in any other sharpener. It provides best performance that are unmatched by world-class maintenance products. It is user-friendly and safe sharpener to provide Fine and Coarse sharpening for all knives with flat grind on both edges of blade as well as fixed angle slot to sharpen serrated edge blades. It provides more angles for sharpening than other systems in the market. It is a pull-thru knife sharpener with adjustable angle to sharpen your kitchen, hunting and pocket knives at the angle as a factory grind. You don’t have to mess with the cumbersome, complex and time-consuming sharpening kits. This 2-stage handheld knife sharpener from Wüsthof needs only a few strokes to sharpen your blades. The V-shaped cutting head adds sharp edge to the knife with two crossed carbide. All you need to place gadget on the flat area and hold E-Z grip handle and knife handle. Insert the blade completely in the slot at 90-degree and pull back a 2-3 times. After setting it with carbide, switch to ceramic side to finish the edge. Manual or pull-through knife sharpeners are known to be very helpful and can benefit you well. You can find them in different styles and shapes. 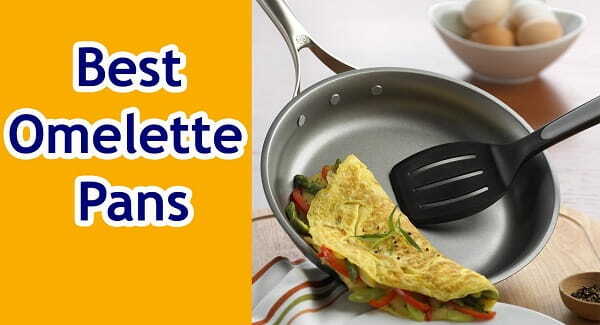 But they can improve the usability and lifespan of your knives with ease. You can achieve cutting edge with superior consistency. We hope the above list of manual knives will help you make the wise decision.